The tiny house has had open walls for so long that it was finally time to close it all up. Although not pretty, the wall had been super functional as soon as the insulation was in. There was plenty of other stuff to do there anyway. As the list of to-dos got shorter, it was time to think about closing up the walls. Initially I had opted for wood walls. This was primarily since I had learned that sheet rock is not ideal for a house on wheels given that all that motion has a strong ability to crack/tear/break sheet rock panels. Regardless of that, I started putting up a 'light' sheet rock upstairs. I just don't like working with the stuff and opted for the oh so popular shiplap look. and it inspired me to do the same. I used two crushed pieces of copper piping to maintain the same spacing throughout. The stuff I used changed at some point but it's effectively a 5mm plywood. I had always intended to paint it so the the look going up was not that important to me. On the right you can see where above a low covering of wainscoting (with a chair rail above it to bridge the gap) the process of installing the shiplap started. 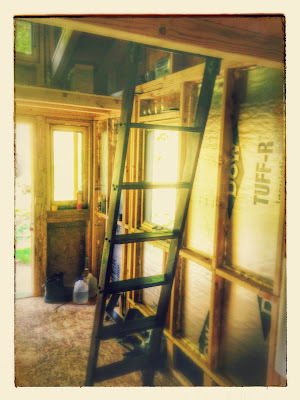 At this point I'm already on the upper section where I had installed the sheetrock already. Since shooting into the sheetrock didn't give me high hopes of good adhesion, I added some glue to be sure. It looked like this when it was all done. Painting it was a quite a chore since you can't get in the groove with a roller, so all the grooves need to be repainted before rolling it. Once you get that done, you are ready for the easy part of rolling it. I used Behr Premium with primer and it did a pretty good job but did need a a second coat since the stuff was pretty absorbent. I also opted for a semi gloss finish. Really like it. Now what do I do with the ceiling? Some say leave it as is...unlikely to happen.